I've always been rather ambivalent towards David Bowie. I do admire his willingness to be a musical chameleon, to be a trend-setter instead of a fad follower, to follow his fickle muse wherever she leads. All of which takes balls of brass. But, other than a few of his songs that I find highly original and enjoyable, his creations have never thrilled me much and I never felt the urge to buy any of his records. Except this one. I picked up this LP in '75 because Wayne Sloan, the new lead singer in my band, thought Bowie hung the moon and coerced us into adding some of his most recent material to our repertoire. That was fine because staying current was a requirement for finding decent-paying gigs and besides, Wayne could imitate the Thin White Duke down to every hiccup. I dutifully learned my guitar parts and then shelved the album for decades until I came across it the other day and wondered if it has gotten better with age. It hasn't. The slick cover pose says volumes. David ain't Ziggy anymore. Seems that in the midst of his tour promoting "Diamond Dogs" Bowie booked time in Sigma Sound Studios (the home of Philly Soul) and became convinced that it was time for him to become a black R&B artist. He hired former James Brown sideman Carlos Alomar and a host of crackerjack session men like Andy Newmark, Willie Weeks, David Sanborn and Luther Vandross to assist him. This was all well and good but David was still the main composer and therein lies the gist of the album's troubles. This pale white boy from London couldn't morph into Superfly overnight and he doesn't even come close. 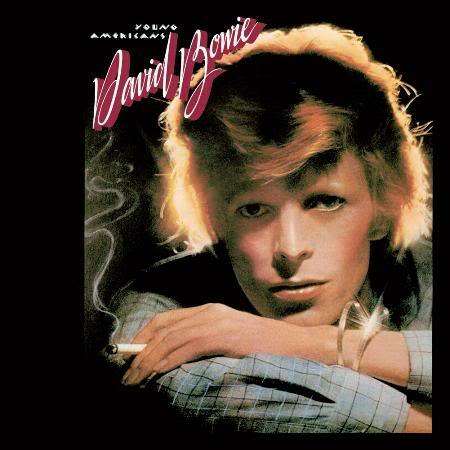 "Young Americans" stumbles out of the gate with one of the thinnest saxophone sounds that Sanborn ever put on tape but Bowie's excited, word-crammed vocal may be the best of the whole album. Not a lot of ch-ch-changes going on throughout the proceedings but the mildly abstract, esoteric lyrics ("All the way from Washington/her breadwinner begs of the bathroom floor/'we live for just these twenty years/do we have to die for the fifty more?'") are some of the most interesting he's ever produced. Musically it's a pretty good effort overall but the horribly out-of-tune guitar at the end of the bridge section makes me cringe ever time. Unfortunately the compliments stop there. On "Win" David tries his damndest to be a soulful crooner but someone should have talked him out of it. "Well, I hope that I'm crazy." he sings and maybe part of him knew he was recklessly venturing into restricted territory that he had no business in. Vandross's chorale arrangements are splendid throughout but they're ultimately wasted on this vacuous stuff. "Fascination" is a too-busy disco ditty that's repetitive beyond reason. Bowie's falsetto is not one of his strong points but perhaps his wispy whimperings are what inspired the then-teenage Prince to follow suit. Who knows? David even has the audacity to utter the phrase "Sho Nuff" midway through and once again he broaches his mental stability with the line "I know that people think I'm crazy/but pleasure seeks this thing like fascination." Whatever. "Right" is yet another in a series of extremely tepid tunes that go nowhere. He warbles that there's "never no turning back" but he should have anyway. "Somebody Up There Likes Me" represents a slight improvement in the songwriting department at this juncture but it's still entirely too predictable to give life to this mannequin. David strives to be Marvin Gaye even if it kills him. Or us. A cover of "All Across the Universe" follows and, even though I've never been wild about the tune in general, it's got to be the worst version of a Beatles' song I've ever heard. Bowie and Lennon had been hanging out together in the mid 70s and perhaps this was David's way of honoring his friend but this is more of a put-down than a tribute. Bowie comes off manically overwrought and ridiculous in his delivery. I hope John never had to endure this travesty. "Can You Hear Me" suffers from the same lame deficiencies as those that preceded it. It's said that the road to Hell is paved with good intentions. I'm sure Bowie meant well but this is just BORING beyond belief. "I'm checking you out one day/to see if I'm faking it all," he avows. Wonder if these days he ever revisits this snooze-fest? I doubt it. As far as prog goes, "Fame" is the only track that comes within a hundred miles of the genre. Built upon one of Alomar's funky guitar riffs, the number is as infectious and alluring as its subject matter and succeeds mainly because David isn't trying to be something he's not and the clever words don't pull any punches. "Fame, what you like is in the limo/Fame, what you get is no tomorrow/Fame, what you need you have to borrow." he laments. Turned out to be his first #1 hit single in the states and it has stood the test of time well. Pretty much everyone finds something to like about this one. Without the title cut and "Fame" (both of which might be more wisely acquired on a greatest hits CD) this album would qualify as a humorless prank played on his fans. "Then why review it at all?" you might ask. Because it's there. And because anyone who is tempted to purchase "Young Americans" needs to know what they're going to get for their hard-earned buck. As I expressed earlier, I have no beef with David Bowie. Anyone who's lasted this long in the cutthroat record biz deserves serious props but a turd is still a stinker no matter how much perfume you spray on it and proggers should keep their distance from this one.